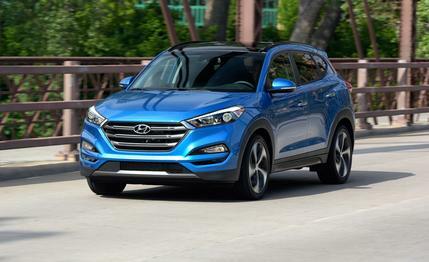 Hyundai's Tucson has long been a nice, middle-of-the-road small crossover. The last-generation car added some much-needed styling pizzazz, and this new one takes it a step further. It's longer, wider, lower, and more mature. It's got a new, more powerful engine, and it gets better fuel economy. It's loaded with more features. However, most of those improvements depend on how much money you're willing to spend. We tested two Tucsons, a base SE with the naturally aspirated, 2.0-liter four-cylinder, six-speed automatic, and front-wheel drive, and a loaded Limited with the new 1.6-liter, turbocharged four-cylinder, new seven-speed dual-clutch transmission, and all-wheel drive. As you might expect, the differences were considerable. Consider the numbers. The SE costs $24,320 as it sits. It weighs 3,296 pounds and makes 164 hp and 151 lb-ft of torque. The Limited costs $32,320 as-tested, weighs 3,606 pounds, and makes 175 hp and 195 lb-ft.
Now consider how they perform. The SE needs 9.7 seconds to hit 60 mph from a stop and 17.2 seconds to cross the quarter-mile mark, at which point it's doing 81.1 mph. Stopping from 60 mph takes 123 feet, and it pulls 0.82 g average on the skidpad and posts a 27.9-second figure-eight lap at 0.60 g average. The Limited, on the other hand, needs only 8.3 seconds to hit 60 mph and 16.5 seconds to pass the quarter-mile at 84.5 mph. Stopping is slightly longer at 128 feet (it's more than 300 pounds heavier, after all), and it pulls 0.81 g average on the skidpad. Lapping the figure eight takes 27.6 seconds at 0.64 g average. For small crossovers, those numbers are about average for each model, if slightly slow. The way each drives mirrors the way it performs. The SE is painfully slow in accelerating and passing, held back by a weak, coarse engine and somewhat slow-shifting automatic transmission. The Limited, with its all-wheel-drive grip and turbo power, is adequately quick in acceleration and passing thanks in part to its fast-shifting dual-clutch automatic. Both hesitate when you first step on the gas, as if they're mustering the strength to get going. It's more noticeable with the dual-clutch transmission, which seems to slip the clutch for a long time. This generates some concern as to how it would perform loaded with people and cargo, something we didn't have an opportunity to test.Both vehicles offer a somewhat stiff ride, but what you trade in ride quality you gain back in handling. They go around a corner well, taking a set and offering plenty of grip. Both feature adjustable steering modes, all of which are typically Hyundai numb but offer different weighting. Braking power is acceptable and the cars are stable under panic braking. If you plan to take your crossover off-road or if you live in a wintery area, we strongly suggest you find the extra $1,400 required to upgrade to all-wheel drive, regardless of engine choice. On a light off-road test course, the SE's combination of front-wheel drive and tires optimized for fuel efficiency made it mostly useless on loose dirt. The all-wheel-drive model with its locking center differential performed considerably better.The same dichotomies play out inside the vehicles, as well. The Limited is nicely appointed with a laundry list of standard features. Its 8-inch BlueLink information and entertainment screen is intuitive and responsive with crisp graphics. The materials are good quality, and the vehicle feels worthy of its price tag. The SE, on the other hand, feels like the cheapest SUV option at the rental counter. All of the fancier safety features are options, just like the conveniences. The monotone coloring, cheap-feeling materials, and dearth of features were disappointments. The rough plastic steering wheel drew considerable rebuke. Functionally, though, the vehicles are similar. Both are quiet inside, comfortable, and easy to see out of. The rear seats are large enough to seat most adults comfortably and cargo space is good. The rear windowsills are rather high due to the styling, which may make it difficult for children to see out.The new Tucson offers a nice upgrade with more space and some of the best styling in the class from the outgoing model. Should you be willing to pay for it, you can add more features than most competitors while maintaining class-competitive fuel economy and performance. In terms of how it drives, we find the new Tucson to be average, but if that matters less to you than features and style, you'll find plenty to like—as long as you're willing to pay for it.